Ruthie Nelson was born on December 29, 1936 in Tyler, Minnesota to Walter and Alice Anderson Sagmoen. Due to the great depression the family traveled though out the country where work was available. In the early 1950’s they settled in Garvin, MN. Ruthie graduated from Tracy High School and then she and a friend moved to Minneapolis for a short time, before returning to Garvin. Ruthie worked at the Garvin Bank. On May 26, 1956, she and Jim Nelson were married at the Lake Sarah Lutheran Church in Garvin. Following their marriage they farmed the Nelson family farm near Lake Sarah. Ruthie held various jobs over the years but her main focus was her family. She and Jim retried in 1992, but remained on the farm until 1997 when they moved to Slayton, MN. Jim passed away on March 14, 2001. Ruthie passed away on Thursday, April 4, 2019 at the Sanford Heart Hospital in Sioux Falls, SD, at the age of 82. Ruthie was an active member of Christ Lutheran Church in Slayton serving in the ladies group, teaching Sunday school, Bell Choir, quilting group or wherever needed. 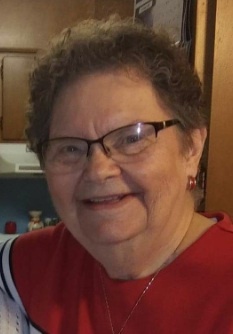 She also was a very active member of the Slayton Community whether it was extension club, 4-H, meal site, Community Band, volunteering, card clubs or at the Murray County Fair. Ruthie was a member of the Nivrag Club and the Slayton Legion Auxiliary. Ruthie enjoyed spending time with her family and friends, collecting recipes, fishing, playing cards, genealogy, music and all types of games. Survivors includes her three children and their spouses, Dale and Linda Nelson of Slayton, MN, Jeff and Joy Nelson of Stoughton, WI, and Tom and Najka Nelson of Avoca, MN, daughter-in-law, Jean Nelson of Slayton, MN, 11 grandchildren, four great-grandchildren, two siblings, Wayne Sagmoen and his wife, Donna of Bloomington, MN, and Karen Keifer of Tyler, MN, and several nieces and nephews and their families. She is preceded in death by her parents, husband, Jim, son, Mark, and brother-in-law, Dennis Keifer. Christ Lutheran Church in Slayton, MN on Wednesday, April 10, 2019 at 10:30 a.m. with Rev. Grant Fischer officiating. The organist is Theresa Nysevold with special music by Heidi Winter. The pallbearers are her grandchildren. Interment is at Bethany Lutheran Cemetery in rural Slayton, MN. Visitation will be on Tuesday, April 9, 2019 at Christ Lutheran Church in Slayton from 4-7 p.m. and also one hour prior to the services at the church on Wednesday.